While the Jammu Lok Sabha constituency recorded 44.65 per cent turnout, Baramulla registered 22.3 per cent till 1 pm, the officials said. 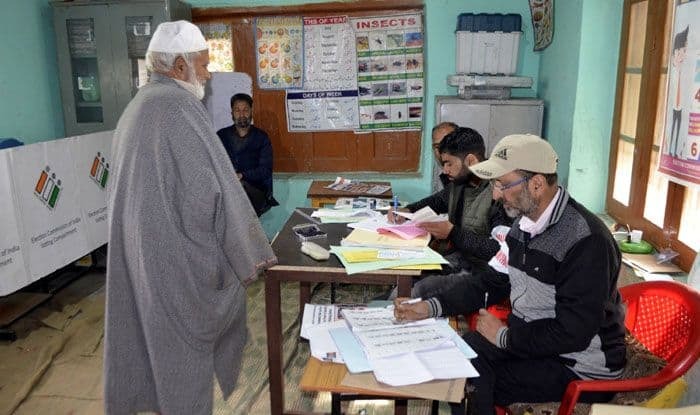 Jammu and Kashmir has recorded over 35 per cent turnout till 1 pm in Jammu and Baramulla constituencies, where voting is underway in the first phase of Lok Sabha elections, even as there were protests over defective EVMs in some areas, officials said. The two constituencies house over 33 lakh electorate. “A voter at a polling booth in Jammu was manhandled by the BSF because he refused to cast his vote for BJP. Using armed forces at polling stations to coerce people to vote for the BJP shows their desperation & hunger to usurp power by hook or crook,” she said in her tweet.